DETROIT -- After posting its biggest first-half profit in 12 years, Ford Motor Co. is sticking with plans to boost earnings next year even as “business conditions” remain challenging. Ford benefited from a 20 percent rise in U.S. sales and limited discounts in recording second-quarter net income of $2.6 billion. It was Ford's fifth straight quarterly profit. During the second quarter, the automaker attracted higher prices for new vehicles such as the Ford Taurus, Fusion, Mustang and F-150 Super Duty pickup. New models generated a $1 billion improvement in net pricing – manufacturer's suggested retail price minus all discounts - during the period compared with a year earlier, Ford said. A $500 million decline in discount spending accompanied $500 million in net price increases. In an interview today, Ford CFO Lewis Booth said the automaker expects pricing to hold strong going forward, before easing in 2011, even amid signs U.S. light vehicle demand this year will fall short of initial industry forecasts. "We continue to launch great product … and are closing the (price) gap with our Asian competitors and keeping our product fresh," said Booth. "We also work hard to match supply with demand." Booth said in the longer term, Ford will work toward keeping inventory levels closer to a 55-day supply, down from the longstanding industry standard of 60-days. In its core automotive operations, Ford earned $2.1 billion during the latest period, compared with a year-earlier loss of $1.1 billion. The latest results underscore how far Ford's automotive business has recovered -- even amid depressed industry sales. As recently as April, Booth indicated the company's first-quarter profit of $2.1 billion would be the year's strongest. All of Ford's global automotive operations were profitable and showed improvement during the latest period. During the first six months of the year, Ford earned $4.7 billion - its biggest first-half profit since 1998. In North America, Ford's automotive business earned a second-quarter pre-tax operating profit of $1.9 billion, compared with a loss of $899 million a year earlier. Ford cited higher sales and favorable pricing for the $2.8 billion swing in North American results. During the second quarter, Ford's automotive revenue in North America soared 58 percent, to $16.9 billion. Overall revenue increased 17 percent, to $31.3 billion. Ford Credit reported second quarter pre-tax operating profits of $888 million, a $242 million improvement from the second quarter of 2009 and a $60 million improvement from the first quarter of 2010. “We delivered a very strong second quarter and first half of 2010 and are ahead of where we thought we would be despite the still-challenging business conditions,” Ford CEO Alan Mulally said in a statement. The results easily topped Wall Street's expectations, and helped drive Ford shares 5.2 percent higher to close at $12.72 in New York Stock Exchange trading today. Ford said today the second half won't be as profitable as the first half, citing higher costs to launch new products, a rise in commodity prices and smaller reductions in reserves at Ford Credit. Booth said prices for steel, copper and aluminum will increase by $1 billion this year. Operating costs will rise over the next few quarters as Ford prepares to build the redesigned Explorer and Focus while continuing to launch the Fiesta subcompact and bring out new engines for the F-150 pickup. Because of weakening economic growth, the automaker narrowed its forecast for U.S. vehicle sales this year to 11.5 million to 12 million units. It had previously assumed demand would be in the 11.5 million to 12.5 million range. U.S. sales of light vehicles dropped to 10.4 million units last year -- the lowest level since 1982. High unemployment, the prolonged housing slump and lackluster consumer spending are undermining U.S. economic growth. 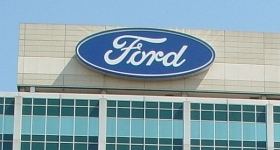 "We believe we have a sustainable and slow recovery," Booth said, adding Ford does not anticipate a double-dip recession. Ford ended the quarter with automotive gross cash of $21.9 billion, down from $25.3 billion at the end of the first quarter. The company attributed the decline to debt-reduction efforts and product-launch costs. Ford said its automotive debt fell to $27.3 billion from $34.3 billion at the end of the first quarter. “One of the high points of the quarter was we paid down $7 billion in debt,” Booth said, adding it is “very urgent” that Ford continues to pare debt. By the end of 2011, Ford expects to move from an automotive net debt position to a net cash position. At the end of the second quarter, Ford's automotive debt exceeded cash levels by $5.4 billion. Ford told analysts today it expects its credit rating - currently below investment grade - to rebound as it whittles down debt. “We remain on track to deliver solid profits and positive automotive operating-related cash flow for 2010, and we expect even better financial results in 2011,” Mulally said. U.S. retail market to be improved compared with 2009. In Europe, Ford posted a pre-tax operating profit of $322 million, compared with a profit of $57 million a year ago and a profit of $107 million in the first quarter. The automaker said today it expected its European market share for all of 2010 to be about equal to the first half of 2010, but lower than 2009, reflecting the company's decision to limit increases in incentives in the region. Ford says it expects its finance arm, Ford Motor Credit, to be less profitable in the second-half compared to the first half, but it will report a full-year profit for 2010. Ford Credit's second-quarter net profits reached $556 million, up from $413 million in the year-ago quarter. Ford Credit expects smaller improvements in the provision for credit losses and depreciation expense for leased vehicles compared with the improvements during the first half.